"Admittedly not the easiest sushi to make, but once you manage it - the result will not disappoint. 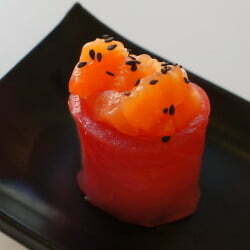 This great looking piece of sushi is also amazing tasting and will impress everybody around." First thing you want to do is make sure you get the right piece of tuna. 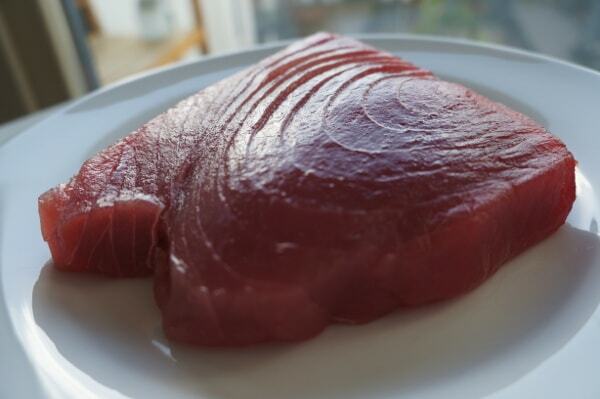 Make sure you ask your fishmonger, or verify that the tuna packaging clearly states the tuna you are getting can be consumed raw. For more information, please refer to our Sushi Grade Fish guide. The piece below was proudly purchased at my personal favorite Moxon’s Fresh Fish in London. It weighs about 350gr and about a third of it was used for making 6 gunkans. 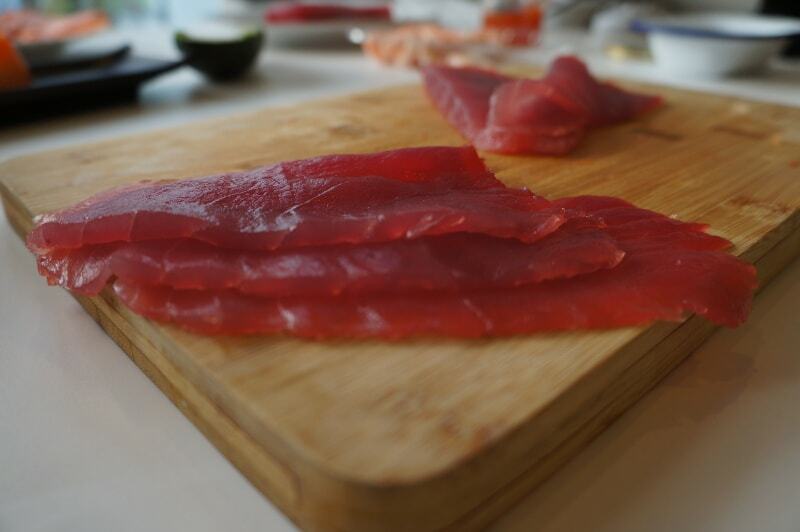 What we want to make is long and thin slices of tuna. It needs to be about 15cm long and 5cm wide. 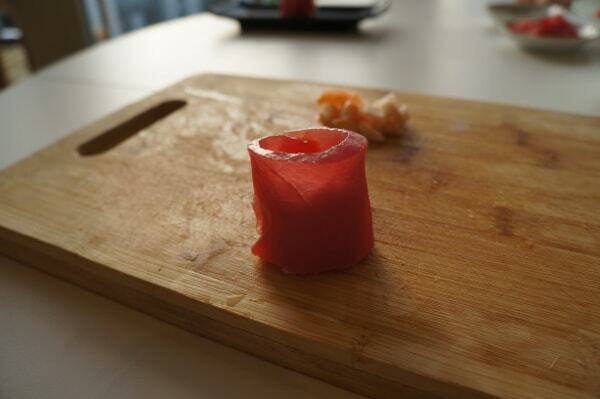 This length of tuna will do for a gunkan piece that’s about 5cm across (4.77cm to be exact). 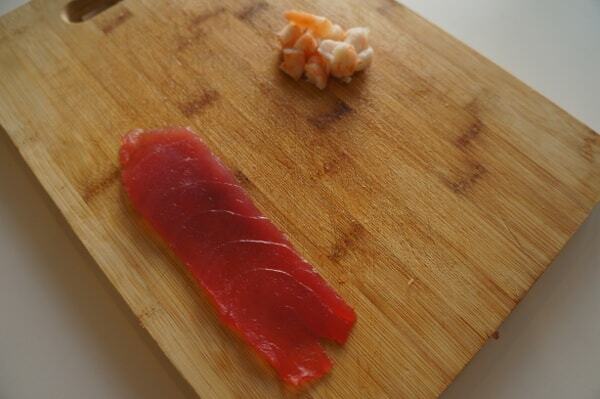 After cutting the right block from the tuna steak you have, comes the hard part, slicing. 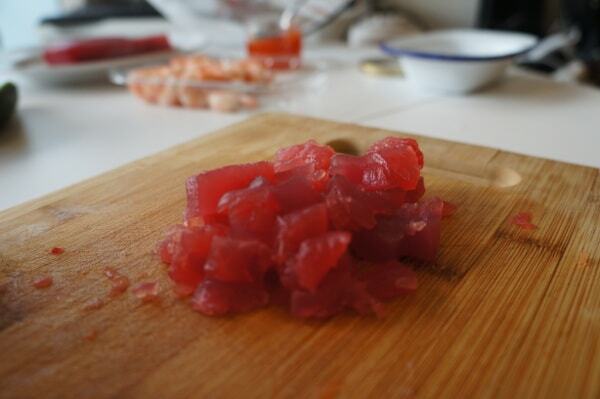 Press the tuna block down with your left hand while cutting 0.5-1cm thick slice with your right. You’ll need a good sharp knife for this. Try to make the slices as even as you possibly can. This is not always easy, and some slices might not turn out perfect. If that should happen, don’t throw good tuna away! Dice it roughly and save it for making Spicy Tuna. Now it’s time to work on the gunkan filling. You can and should get creative! But for this recipe, I’m suggesting Salmon or Shrimp. Four medium size shrimp should do for one gunkan. Next is the rice ball that is going to make the base of the sushi. The ball needs to fill about 2/3 of the gunkan piece. Try making one and see if you manage to wrap the fish slice around it. Make adjustments if necessary. This part is really simple. 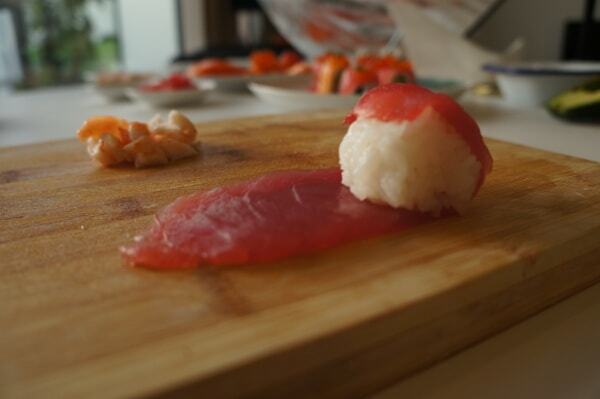 Roll the slice of fish around the ball of rice, slightly tightening it as you go. Make sure you get some overlap at the end, but not to much. It is best if you get it right the first time, but you might find the rice ball is too large or small. No to worry, adjust the rice ball and try again if needed. After it is rolled, stand the gunkan on its base and press down the rice a bit. You can use the other hand to wrap the gunkan, making sure it doesn’t break. Using a spoon, scoop in some of the filling you chopped earlier into the gunkan. Be generous. Consider topping your gunkan with black sesame seeds, fish roe, spring onions etc. What ever you fancy. That is it, you are done! Check out more recipes below. Wow… Learnt something new here. Thanks a lot. Admitted. 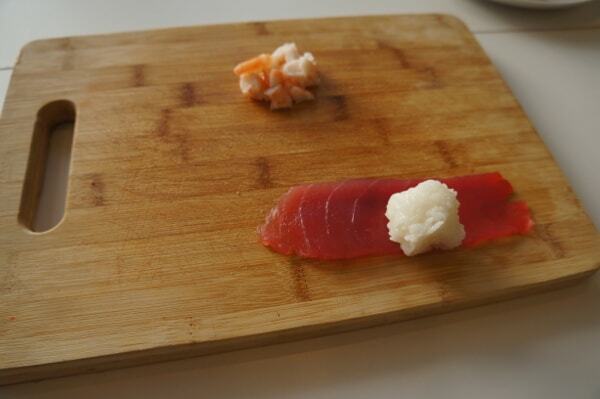 No easy to make like other sushi. I’ve tried a number of times. Will keep trying. I’ve tried a couple times but yet to really get it right. Will follow this guide and try again. I just hope I get it right this time.